A great option for first timers and business travelers who expect a high standard of Western amenities and comforts, dramatic city views, plus a central location. The JW is walking distance to just about every major attraction in town—i.e. The Bund, The French Concession, People’s Park—and spectacular views night and day from the 39th floor lobby, 55th floor bar and virtually every room. Another high point: the only outdoor hotel pool in town, in addition to an indoor one. What’s better than a town with a Four Seasons? How about a town with two of them? Shanghai’s got the Four Seasons Pudong, across the river in the financial district, as well as my favorite, the centrally located, more manageably priced, Four Seasons Puxi, smack in the heart of town. In addition to spacious rooms, luxurious linens and elegant, unexpected touches like delicately embroidered wallpaper and walk-in closets, there’s also a Jr. Olympic length indoor lap pool, Michelin-starred Chinese restaurant and a full-service, utterly serene spa. My pick? The so-good-it-almost-hurts, deep tissue Dragon Massage as a jet-lag-recovery-must. Another bonus: The Four Seasons Puxi is a stone’s throw from Shanghai’s newest attraction: The just-opened, world’s largest Starbucks, a multilevel, 30,000-square-foot cathedral devoted to all manner of coffee, plus tea, eats and treats. It often has lines around the block, contained by a red velvet rope, no less. At the far end of the Bund, in an up-and-coming, formerly industrial area, the W has just established its latest high-style beachhead—and it’s extraordinary. Just nine months old, The W Shanghai is a wonderfully over-the-top, living museum of East-meets-Western art. It has sculpture and design with quirky touches, such as a soaring atrium lit by a custom-made neon art piece; cozy alcoves; restrooms covered in red lacquer or golden bricks; and practical necessities, such as upscale restaurants and tucked-away meeting spaces in ballrooms. 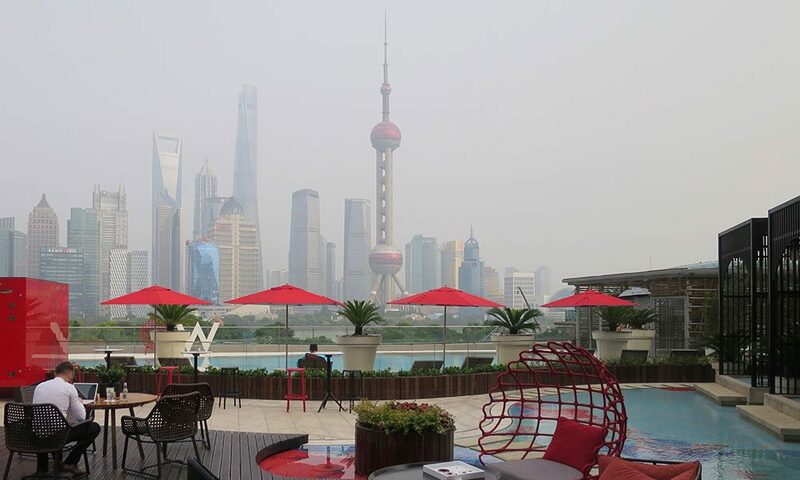 Built directly facing Shanghai’s iconic, slightly kitschy, Space Age-inspired Pearl Tower, the hotel’s glamorous, sculpture-laden pool area overlooks the Huangpu River making it a magnet for Instagram influencers who can’t resist sharing the views—and their best pouty faces—with their followers. For over-the-top modernist luxury with a heavy “Asia Moderne” bent, look no further than the just-opened Middle House boutique hotel. It’s a minimalist masterpiece decked out in elegantly somber, multimillion-dollar commissioned works, including a framed burlap kimono covered in 12,000 handmade ceramic butterflies and a $3 million custom-made-in-Italy chandelier—and perfectly accessorized by a gorgeous, willowy staff that looks like it stepped out of the pages of Vogue China and GQ, with a slightly goth twist. Besides the luxurious guest rooms—think cashmere and leather in tones of beige and black—The Middle House is also home to the high-gloss, soon-to-be foodie mecca Café Gray Deluxe, created by New York City-based Chef Gray Kunz, featuring an international menu whipped up in a completely open kitchen and served with a nouvelle Shanghai spin. This too, is just around the corner from the China-sized Starbucks.